-There is a new component: Concentrator ! – A Concentrator can receive (colored) laser(s), it merges colors then throw a new laser of the resulting color to its own direction. 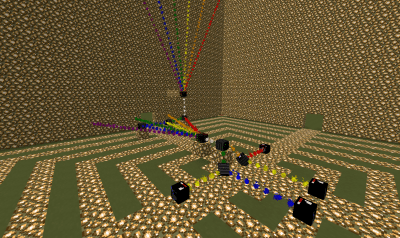 So it’s a way to combine colors but it’s also a new way to redirect lasers. – A Concentrator can always be rotated by enigma creators (people with the edition permission). – A Concentrator can be rotated by players if the enigma creators allow it (it is possible to disallow its vertical/horizontal rotation using 2 new items). But if the enigma is reset (when every player have leave the area) it will be rotated back to the rotation defined by the enigma creator.